The following shows the historic rise in the Fed's balance sheet over the past 5 years. 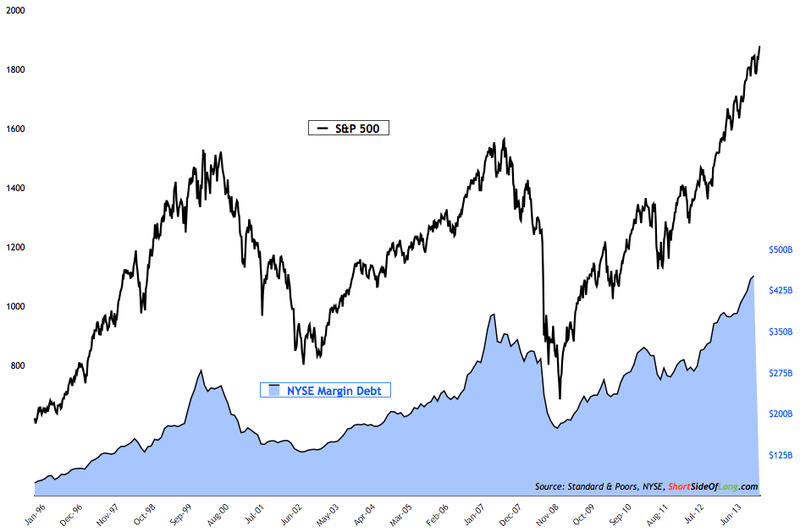 Thus far during the reflation cycle this money has found its way into risk assets, most recently the U.S. stock market. While this process benefits the 1 percent significantly, Fidelity recently reported that over half of their 401k plans have less than $25,600. A major stock market move over the next two years is not going to significantly change these people's lives, or more importantly, their spending habits. While the large and liquid corporate bond market has seen a tremendous influx of liquidity (specifically junk bonds), small businesses have been shut out of the debt markets. The small business optimism index has remained at depressionary levels since late 2007. Small businesses contribute the bulk of the hiring in the United States. As they have not had the capital to grow, they have not had the ability to hire. This has led to a "jobless" recovery. I hope it is easy to see that this process is unsustainable. What could derail such a perverse economy? 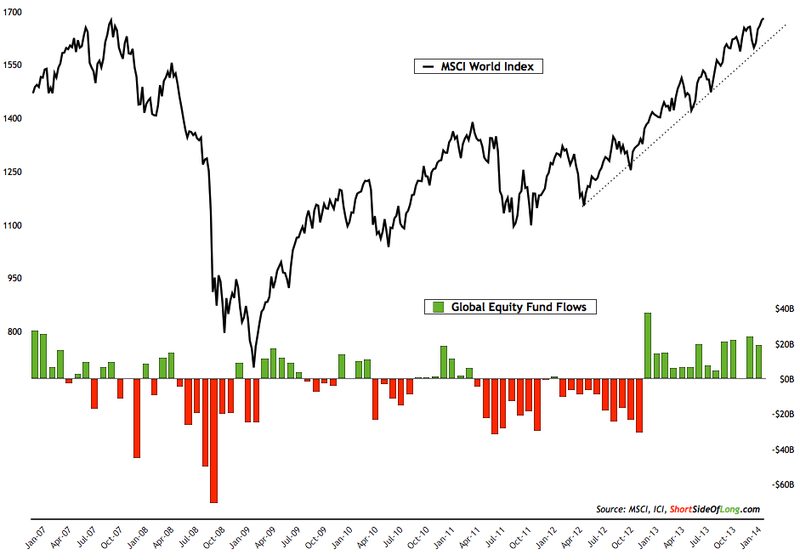 One scenario would be some of the trillions in QE liquidity moving away from U.S. stocks toward commodities. This would put inflationary pressure on the Fed's ability to continue to prop up the artificial asset markets. This may have already begun as commodities, specifically agriculture (food prices), have burst higher to start the year. The only scenario stopping reckless government spending will be higher interest rates. Like children, only the bond market can force their hand. Up until this point the Fed has been lucky to have a "perfect" reflation with money focused toward stocks, bonds and real estate (though some would argue that rising housing/rental payments to do not make life easier). If commodities continue to rise while bonds, stocks or real estate begin to roll over, then the Fed will be forced into very a difficult decision. Everyone assumes that food prices will immediately fall if the U.S. economy slows down. This may very well happen, but why is that correlation assumed as a fact? Prices are determined based on global demand, and the world is very hungry. The recent move in the commodity index is below. A preview of what is to come? The chart below from John Hussman uses a basket of value indicators to show the under or over valuation of the U.S. stock market. You can see that we are currently more overvalued than the peak in the late 1960's and the peak in 2007. The only question is if this move will bring us back to the 2000 mania before finding gravity. It would take an enormous price decline to bring the market back down to fair value and an event much greater to make them inexpensive. The retail investor has now poured money into stocks for 15 straight months. 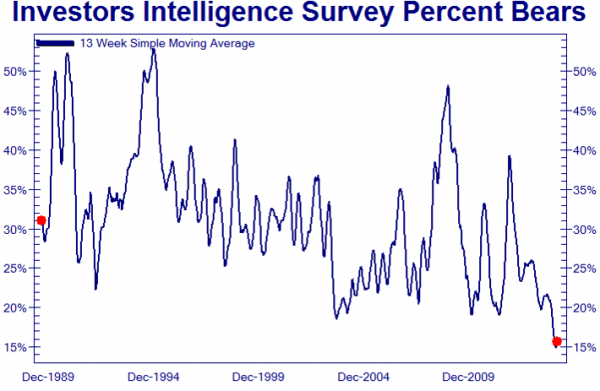 Bearish sentiment peaked in 2008 and has fallen steadily for over 5 years. Complacency is fully entrenched. 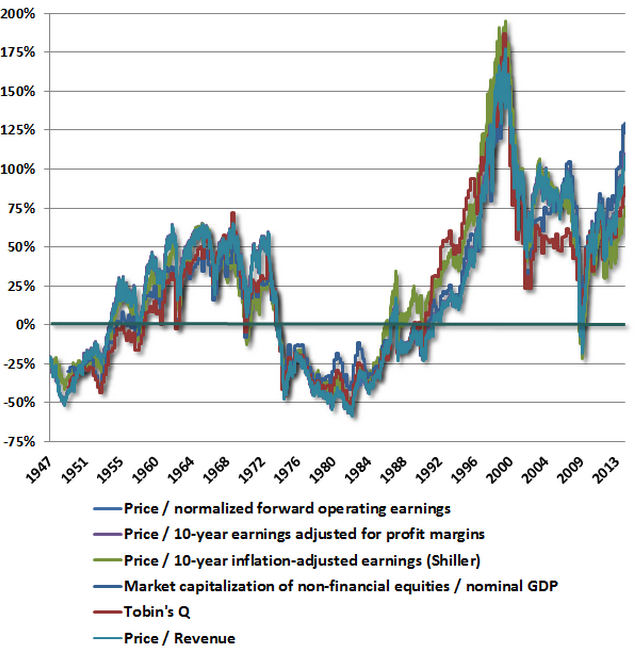 Charts and data: Hussman Funds, STA Wealth and Short Side Of Long. The chart below helps visualize the insanity currently taking place in the IPO market. 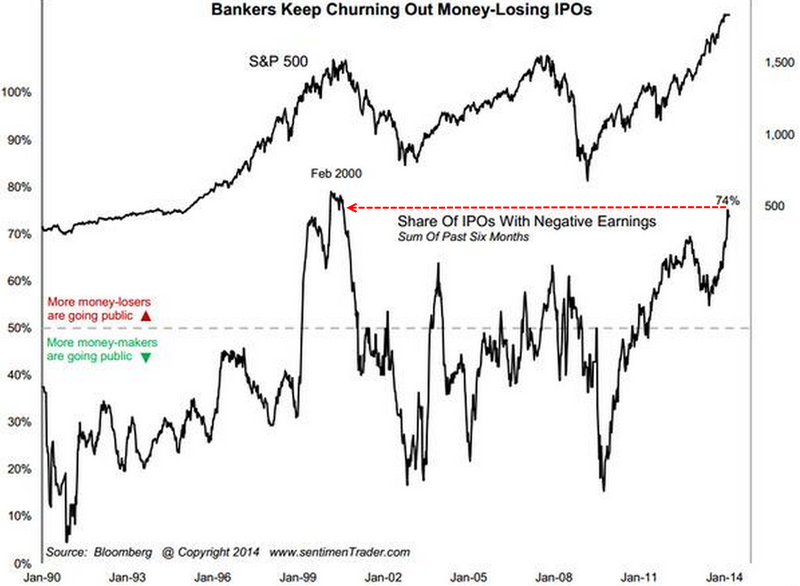 74% of the companies taken public in the last six months are losing money. The only example of a period close to this type of liquidity driven euphoric climax was the original dot com bubble back in February 2000. 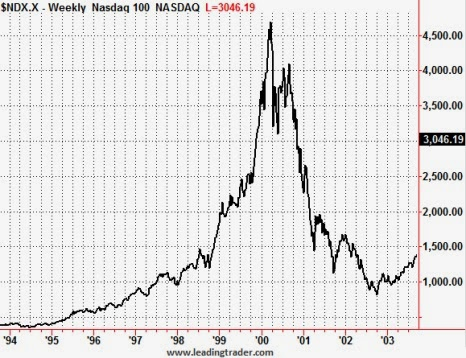 The NASDAQ would peak just a few weeks later before falling 80% (see second chart below). It is staggering that we can be back to this point in less than 15 years. If you like to play Russian Roulette, now is the time to jump into risk assets for the grand finale. You'll notice that at market bottoms investors demand proven companies that are profitable before risking their capital. In the 1990's we had a stock bubble. In the early 2000's we had a real estate bubble. Now we have the grande finale which is the bond bubble. Unfortunately, a large part of the reflation in stocks and real estate since 2009 has been due to the secondary impacts of the bond bubble. I say unfortunately because they will be hurt simultaneously when the bond bubble bursts. A picture usually tells the best story and that is certainly the case for the chart below. The largest amount of froth within a bubble usually takes place in the most dangerous portion of the asset class. Near a peak, the lowest quality assets are lumped together with the highest quality because there have been no defaults in both the high and low quality issuance (think how subprime mortgages were priced the same as high quality mortgages back in 2005). "Loans extended to companies or individuals that already have considerable amounts of debt. Lenders consider leveraged loans to carry a higher risk of default and, as a result, a leverage loan is more costly to the borrower. In business, leveraged loans are also used in the leveraged buy-outs (LBOs of other companies." Higher risk of default? That only means higher yields in the minds of investors today. 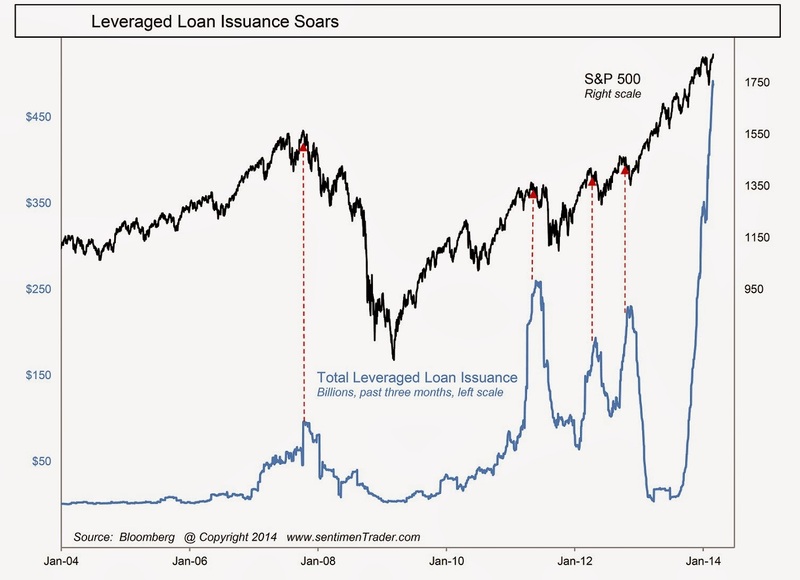 The blue line below shows the mind boggling issuance of leveraged loans over the past three months. This new mountain makes the 2007 issuance look like a mole hill. The unemployment rate has improved dramatically over the past few years, but we know that this is due in large part to people dropping out of the labor force. The common assumption during the "recovery" has been that people are not looking for jobs because they are retiring. The chart below helps illustrate why that is not true. The pie represents the total number of "missing" workers since the depression began in December of 2007. 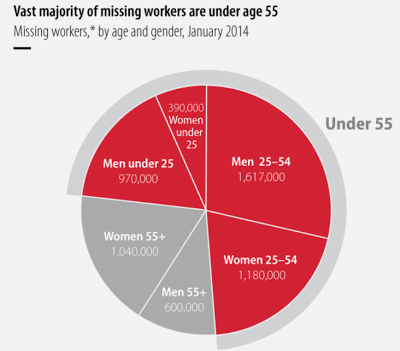 The vast majority, shown in the red portion, are those under 55 years old. They are not retiring, but have given up looking for work because either no jobs are available or they have learned to live off of government subsidies. This is the dilemma the Fed now faces. After 5 years of quantitative easing the Fed once again has asset bubbles in stocks, bonds and real estate. While food, energy, utility and medical costs are rising, the real job market is not improving. Should they continue to taper allowing asset prices to move closer to reality (crash)? Or should they continue on with their obviously ineffective science experiment? The Universa Investments founder reviews why it is important to maintain dry powder today for the investment opportunities coming when when the market "reprices itself" back to reality. He discusses how difficult that is in today's artificial world, saying that although you feel like an idiot holding cash today you will be very happy you did so when the music finally stops. In 2008 the global economy and financial system suffered a heart attack due to the excessive debt taken on around the world. The heart attack was triggered by the collapse of the subprime mortgage market in the United States. Just how large has the debt mountain grown? 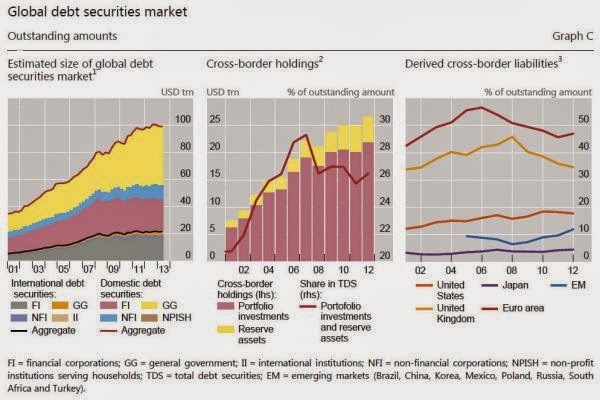 According to the BIS, from mid 2007 to mid 2013 global debt has grown from $70 trillion to over $100 trillion. You can see in the chart on the left below that the bulk of the growth since 2008 has come from the government sector (yellow). As of mid 2013, total government debt had grown to $43 trillion. Gross World Product is approximately $74 trillion today providing a ratio of the debt burden to the total size of the global economy of 135%. To put this in context, Greece's economy begin to collapse after it crossed the 130% debt to GDP ratio a few years ago. In very simple terms, the world has taken on far more debt than it can ever repay. As long as new debt can be issued in order to refinance what has been borrowed, helped by the "easing" of central banks, then the debt mountain will continue to grow larger and the global economy will continue to grow at a stagnating pace. Astute observers will note this is also called a ponzi scheme. The problem, which we saw back in 2008, is that this situation is unsustainable. The biggest question facing investors over the next decade is how the next collapse will unfold. There are five main areas of the world that could immediately trigger a debt crisis. What is fascinating is that each region has a unique story. You could write an entire book around each one. Which crisis will erupt first? I have no idea. When you take the time to research each individual story, it feels as if you are an engineer watching five bridges that are structurally ready to collapse. We live in a world today where people believe that because these bridges have not yet collapsed, that they never will. Most global stock markets, real estate markets and bond markets have not priced in any potential risk with these five bridges. Just as investors once believed that real estate prices could never decline, market participants today are 100% certain that central banks around the world will be able to levitate each bridge supernaturally when they begins to crumble. 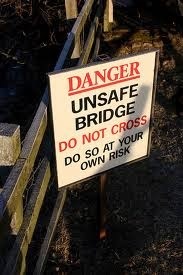 As an investor, your goal should be to avoid the bridges completely. There will be tremendous opportunity when the mis-allocated global capital realizes the mistake it has made and begins to panic. I will have much more in the weeks and months ahead on the individual data behind each region above, specifically China which could face major challenges in their credit markets over the next 18 months. This weekend marks the 5 year anniversary of the cyclical bull market in U.S. stocks. The late great Mark Haines called the stock market bottom to the day 5 years ago, one of the greatest market calls in history. Flashback To March 2009: What Was The Outlook For U.S. Stocks? When was the last time we had a cyclical rally last over 5 years? 2002 to 2007, which was a rally that lasted five years and one day. During the finale of the last five year cyclical bull market we heard that the new secular bull market was in its early stages due to fair price to projected earnings ratios (sound familiar?). The market would then collapse 57% in the following 18 months. 5 years into this cyclical bull market rally, the bears have once again disappeared. Everyone agrees that the winter just now winding down (hopefully) has been brutal for most Americans. And while it's easy to conclude that the Polar Vortex has been responsible for an excess of school shutdowns and ice related traffic snarls, it's much harder to conclude that it's responsible for the economic vortex that appears to have swallowed the American economy over the past three months. But this hasn't stopped economists, Fed officials, and media analysts from making this unequivocal assertion. In reality the weather is not what's ailing us. It's just the latest straw being grasped at by those who believe that the phony recovery engineered by the Fed is real and lasting. The April thaw is not far off. Unfortunately the economy is likely to stay frozen for some time to come. Over the past few weeks, I have seen just about every weak piece of economic news being blamed on the weather. First it was lackluster retail sales that were chalked up to consumers being unable or unwilling to make it to the mall. (This managed to ignore the fact that online sales were similarly weak - which would be unexpected for a nation of snowed in consumers). Then came the weak auto sales that were ascribed to similarly holed up potential car buyers. However, this ignores that while GM and Chrysler sales were way down, sales for luxury cars like BMW, Mercedes and Maserati, surged to record high levels (more on that later). No one offered a reason why wealthier motorists were able to brave the cold. A number of other data points, such as lower GDP, productivity, ISM and factory orders were also ascribed to the elements. Of course the biggest weakness ascribed to the snow and ice has been the very disappointing employment reports over the last few months. Analysts faced a very difficult task in squaring these reports, which showed fewer than 187,000 new jobs created in December and January combined, with the accepted narrative that the recovery was firmly underway and that the economy was no longer dependent on the Fed's monetary support. The weather continued to be horrible in February and as a result, there were wide expectations that today's February jobs report would be similarly bleak. But this morning's release detailed a slightly better than expected 175,000 new jobs, thereby convincing economists that the economy was so strong that it is overcoming the drag created by the weather. This lays aside the fact that 175,000 jobs should not be causing any optimism. After years of sub-par job growth, I believe a recovering economy would be expected to create more than 300,000 jobs per month in order to make a real dent in underemployment. Those levels, once routine in past decades, seem untouchable today. But weather-related pessimism had caused economist to ratchet down their predictions to just 150,000 jobs in February. Based on that, today's numbers were seen as a win. Drilling deeper into the report will provide little reason for optimism. The labor force participation rate stayed at a generational low and the unemployment rate edged up. On the other hand, the long-term unemployed (those out of work for more than 27 weeks) increased by 203,000 to 3.8 million. Furthermore, over half of the jobs created were low-paying or part-time jobs in education, health care, leisure and hospitality, government, and temporary services. Higher paying information jobs declined by another 16,000 following last month's 8,000 loss, and manufacturing added a scant 6,000 jobs. The report also contained data that shows how older workers are coming out of, or postponing retirement. This trend is likely caused by inadequate savings rates, low interest rates, and increases in the cost of living that are rising faster than official CPI numbers. Not only does this point to falling living standards, but the jobs being taken by these older workers would normally be filled by younger, less skilled workers, who are left unemployed, buried beneath a pile of student debt and living in their parent's basements. In truth, economic activity persists in good weather and bad. Winter is largely predictable. It comes around once a year, basically on schedule. Consumers are used to the patterns and know how to deal with them. But don't tell this to today's economists. A much more plausible explanation to me is that the economy has been weak recently because it is weak fundamentally. The data deterioration corresponds not just to unseasonably low temperatures but also to the diminishment of monthly QE from the Federal Reserve. 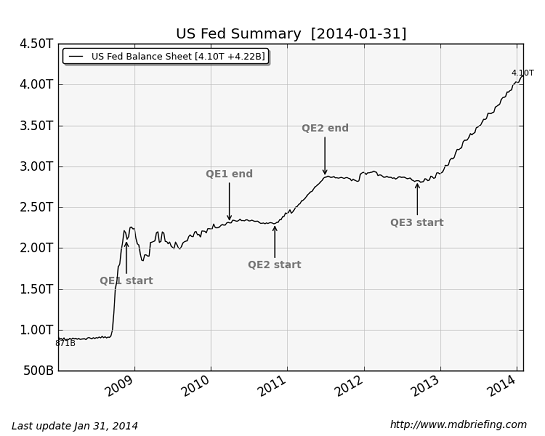 If you recall the highly anticipated "taper" finally began in mid- December. From my perspective the Quantitative Easing has become the sunshine that drives our phony economy. Diminish that sunshine and the economic winter spreads. But the sad fact is that QE can push up prices in stocks and real estate, but can do very little to affect positive change in the real economy. That's why I believe that BMW's are selling like hotcakes even as Chevies sit on the lot. Our current policies help the wealthy at the expense of everybody else. Unfortunately, I don't think the economy will improve as long as the QE keeps us locked into a failing model. What's worse, once the weather warms and the economy does not, look for Janet Yellen to first taper the taper, then to reverse the process completely. So be very wary of the rationalizations that come from economists. I believe they are being used to hide the truth. I just can't wait to see the excuses they come up with once the flowers start blooming in April. They will be doozies.